Shaun in Japan: Kansai trip day 3: Kyoto! 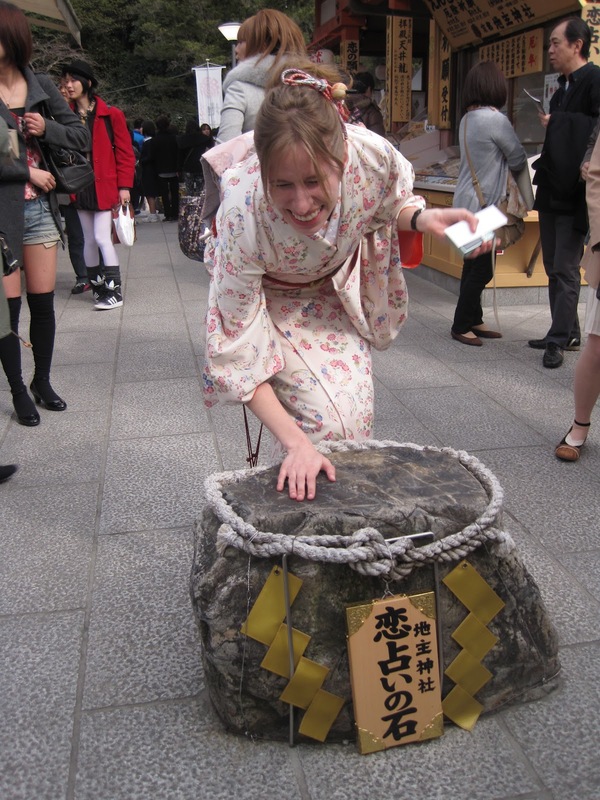 Our next mission was a trip to Kyoto. Before heading to Osaka, we made a reservation with the kimono rental shop Sensho Kitamura, so we had to wake up and head out early enough to make our 11am reservation. Luckily it's only like 45 minutes from Osaka station to Sensho Kitamura, but we got lost, so we were late anyway. 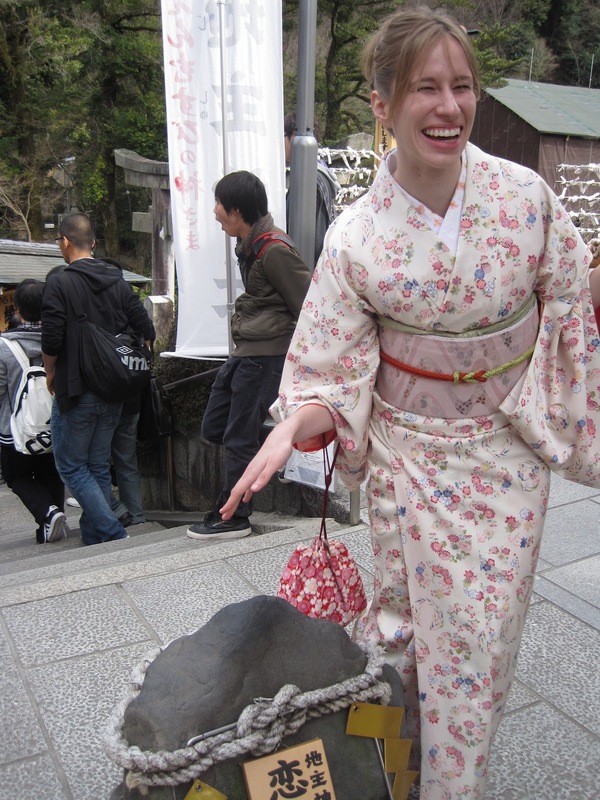 The process of getting dressed up in the kimono is completely bizarre. Apparently in the past, when everyone wore kimono every day, everyone could dress themselves, and they'd just shrug them on no matter how they hung on their bodies, tie on their obi, and get to work. Now, though, kimono are for getting dressed up fancy, so having the garment line up correctly with your body is important. Curves are no good for kimono. As the ladies at Sensho Kitamura kept telling us "Nice body" isn't good for kimono. So how did they fix Laura's and my nice bodies? Towels. Lots and lots of towels padding our upper bodies so that the kimono would hang properly. Eventually I got used to wearing it all, but it was heavy! 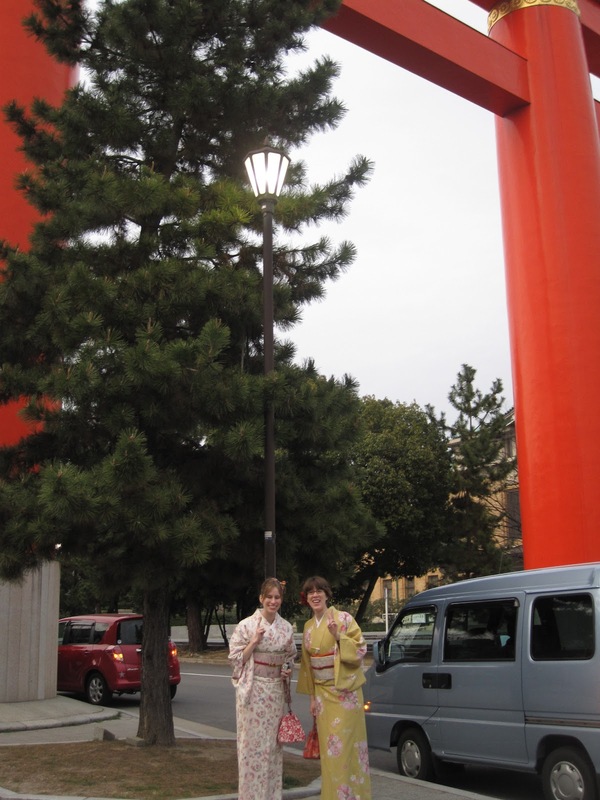 We also wore leggings and a sort of kimono-sweatshirt (like a "shrug" - are people still wearing shrugs? A short sweater that doesn't close in the front- with sleeves just short enough to be hidden by the under-kimono) under it all so we wouldn't get cold. After we got all dressed up in our kimono (we're living the proverb I linked in the last post: 京の着倒れ、大阪の食い倒れ - Kyou no kidaore, Oosaka no kuidaore, "Overindulge in fine clothes in Kyoto, overindulge in food in Osaka"), the ladies at Sensho Kitamura also did our hair and we got to borrow a purse to take our valuables with us. Then we set out to explore the city. 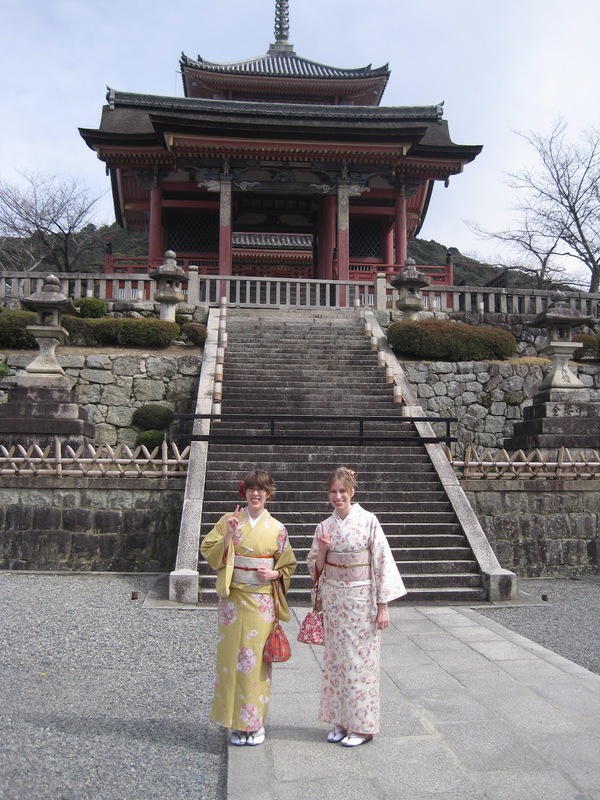 We didn't get much exploring done, because it takes forever to walk around in kimono, and to find anything by bus when both of you forget your bus maps at the kimono shop. But all kinds of people wanted to take pictures of us! We were like celebrities. Everywhere we went someone wanted a photo. Even if we were eating ice cream. Here's the run-down of the sightseeing we managed to do. 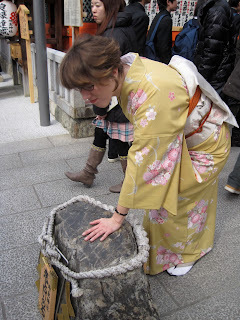 We stumbled across this really cool dragon procession thing at Kiyumizu-dera, but I have no idea what it was about. I bet you a quarter that most of the people watching didn't either. Koi no ishi, the rock of love. Of you can walk with your eyes closed from this rock to another one a little ways away, you'll have good luck in love. Or something. I made it. This means something. I actually photographed Laura in action instead of posing afterwards, so her pics are cuter. And Laura made it too. 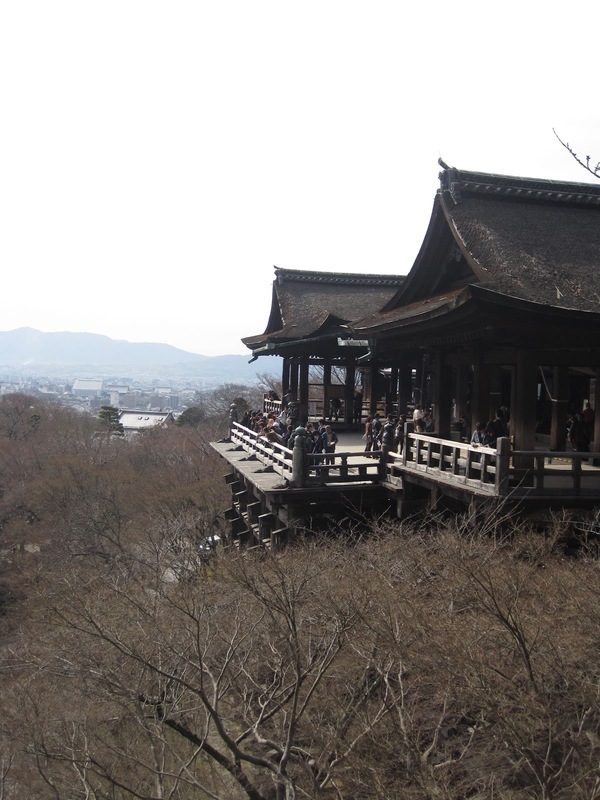 There's the famous view of Kiyomizu-dera you usually see. 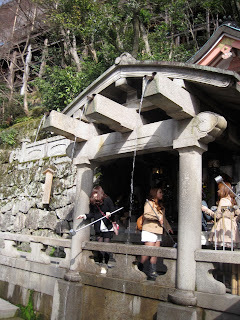 The "waterfall" at Kiyomizu-dera. Supposedly drinking the water here means something (one stream is wisdom, one is strength, one is something else?) but Laura couldn't remember so I just picked one at random. And strangers photographed us. Next we got lost in the bus system somewhere around Gion and headed for Heian Shrine. We made it there right as it was closing. It was basically closed, so there was no one there. "Look how big it is!" 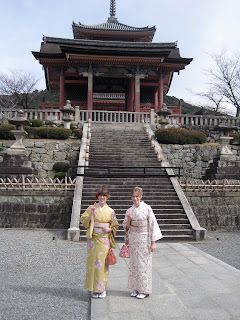 So, after being lost on buses and walking about in kimono for many hours, Laura and I finally made it back to Sensho Kitamura, got redressed in our previous clothes, although our hair remained in its kimono style. The ladies at Sensho Kitamura took our flowers and hair sticks, but our hair spray, elastics, and bobby pins stayed right where they were. I'm pretty sure I heard someone who was sitting behind me on the bus back to Kyoto Station commenting on this. 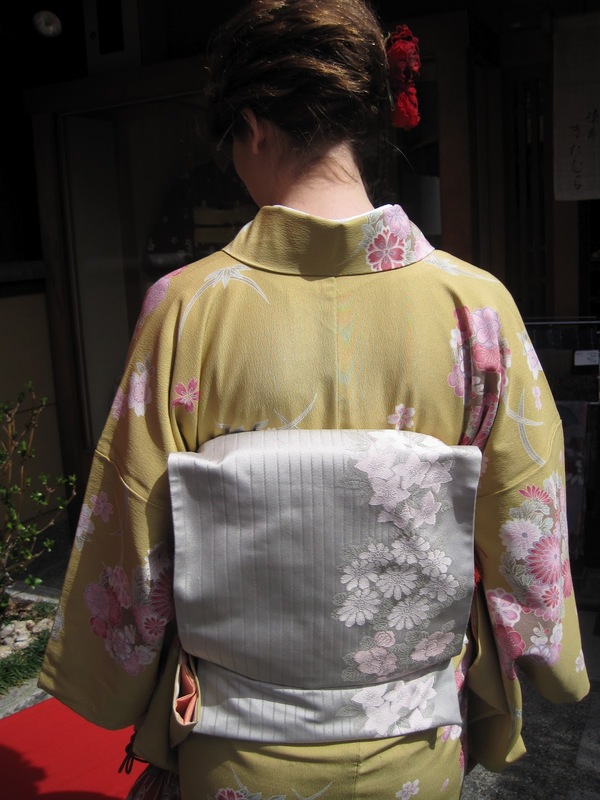 He had a good look at the back of my head, which, in it's updo, did not look like someone's everyday hair, and he was saying "Yeah, sometimes foreigners dress up in kimono and go to Sanjusangendo and stuff like that." We overheard a lot of people talking about us in Kyoto, but it wasn't rude, like it usually is in Tokyo. It was interesting, though. When we were standing in front of Kiyomizu-dera, we heard some boys saying "Nanpa shite ikou ka?" which made us crack up because it means "Should we go try and pick them up?" Mercifully, they kept our distance. 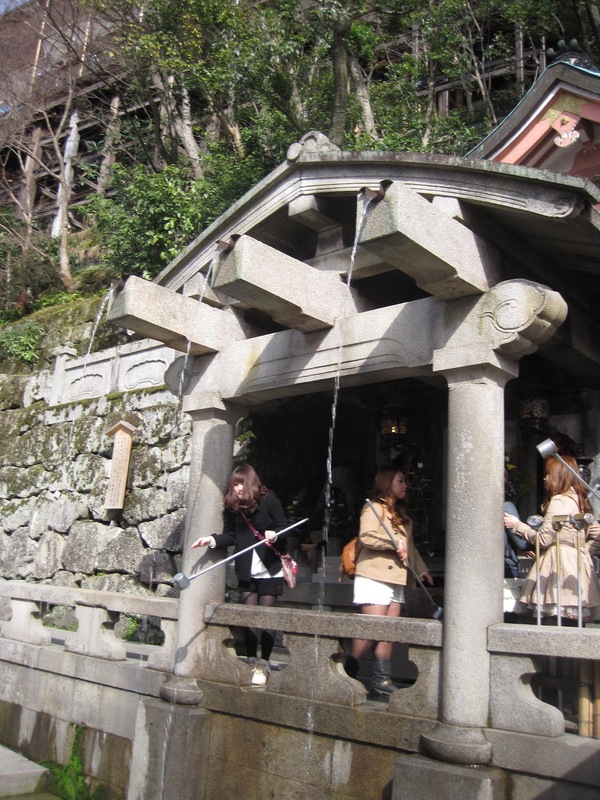 Waiting in line to drink from the "waterfall" at Kiyomizu-dera, we heard a group of girls glancing our way and saying "with us," questioningly in English. Laura looked over their way and was like "Shashin torou ka?" (Should we take a picture?) and they got really flustered but really excited that we could speak Japanese. They told us "later" in English and we met up after we had all gotten through the line. When we were leaving Sensho Kitamura, a couple who was walking stepped to the side so we could pass them, saying something like "Ashi nagai kara ne" (It's because they've got long legs, I guess) and I brightly told them that we had been wearing kimono all day so we could finally move our legs properly. They laughed and said we must have looked great. My host family also told me that Kyoto people have the reputation for being really friendly, but that means they're terrifying when they're angry. Osaka people bluster and yell, but Kyoto people get quiet and stay friendly. Yikes. After walking around Kyoto, we still had our half-hour train ride back to Osaka, and we were exhausted and starving. We weren't sure what to eat, but then I remembered a review I saw in the Japanese guide map I picked up at J-Hoppers. 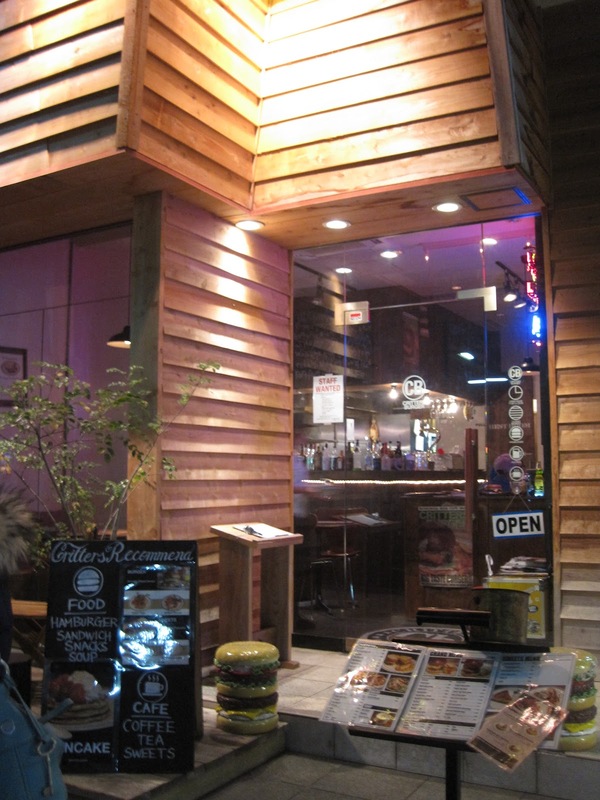 It was for Critters Burger, the representative burger of Kansai. They were open till 11:00 and they didn't look too hard to find, so we decided to go for it. And oh boy, was it worth it. I'm hungry for dinner now, mind you, but my stomach is getting happy just remembering the place. 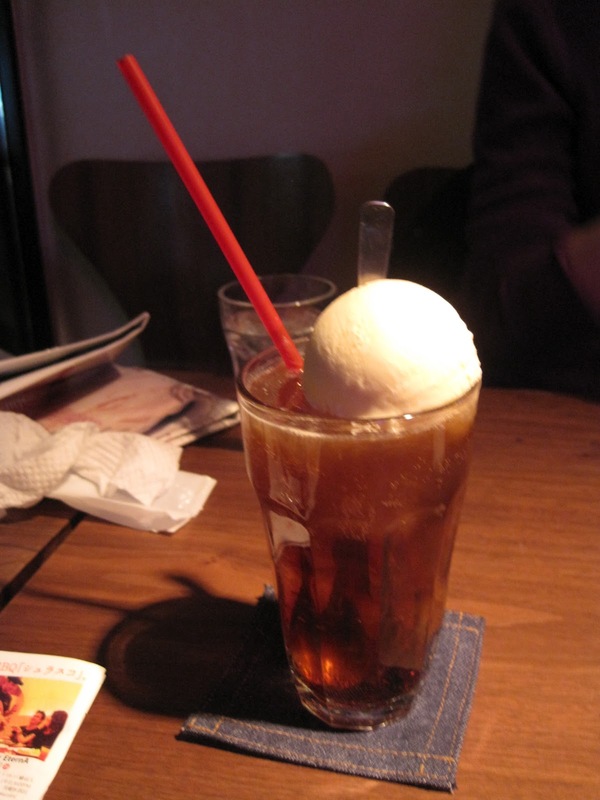 We had root beer floats, which were awesome because root beer is stupid-scarce in Japan, and oh man, the burgers. Our guide map had a coupon for one free topping, so I got an avocado bacon cheese burger but didn't have to pay for the avocado, and Laura did the same with an avocado burger. Even though Japanese bacon is just not American bacon, it was a dream. I only wish I had more fries. I should have taken a picture before the ketchup carnage. But they had American mustard! 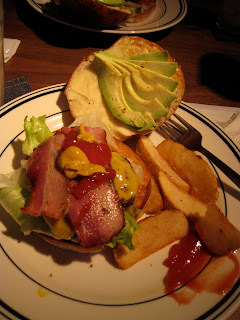 And there was butter on that top bun under the avocado. I never realized I wanted butter and avocado on bread so bad. Here's the outside of Critters. I'll find you directions if you want to go there. Gotta find my Critters Freak sticker that I picked up at the register. It was a beautiful, beautiful burger experience, and I wanted to share that with you all. I was moved by flavor. 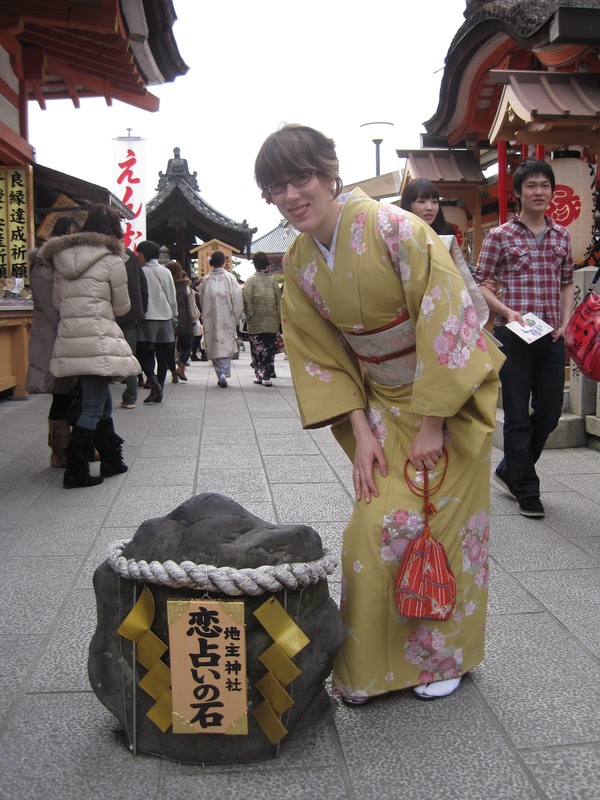 The kimono thing was pretty cool too.